I’m looking forward to meeting you! On your first visit, we are going to do three main things. We will talk about your health and what you want to see change. We will do an exam and you will receive a chiropractic treatment. After you fill out the new patient paperwork (which you can print and fill out at home—see below), we will talk about what brings you into the office. What do you want to improve? Do you want less pain, more energy, more ability to move your joints? What do you want to be able to do? Walk to the store without having to stop and rest? Enjoy your weekend with your family without that creeping anxiety about your kids or job? Go to an exercise class with your friends? Have a natural childbirth? We will talk more about what you want from your body and what has happened in the past that has resulted in your current physical, mental and emotional health. The emotional, mental, physical and chemical experiences of your life have all contributed to your current health. Chiropractic works by helping your brain and body communicate better. In your exam I will be looking for where your body is communicating too much, which can cause pain, anxiety, allergies or other concerns. I will also be looking for where your body is not communicating enough. These areas of decreased communication are the areas where you are not able to fully heal. They are the areas that are preventing your body from healing and adapting. The exam will involve having you sit, stand and lie down. If you are unable or uncomfortable in some of those positions, we can easily modify the exam to accommodate your needs. I will ask you to move and bend in different ways, again based on your ability. If you are pregnant, we have special pillow to allow for your comfort. You will remain fully clothed. If you want to remove your shoes, you are welcome to do that. We will not take x-rays or do other technical diagnostic tests. If you have x-ray, MRI or other reports from a medical doctor, you are welcome to bring them. I am happy always to have more information! But they are not necessary for this type of chiropractic care. 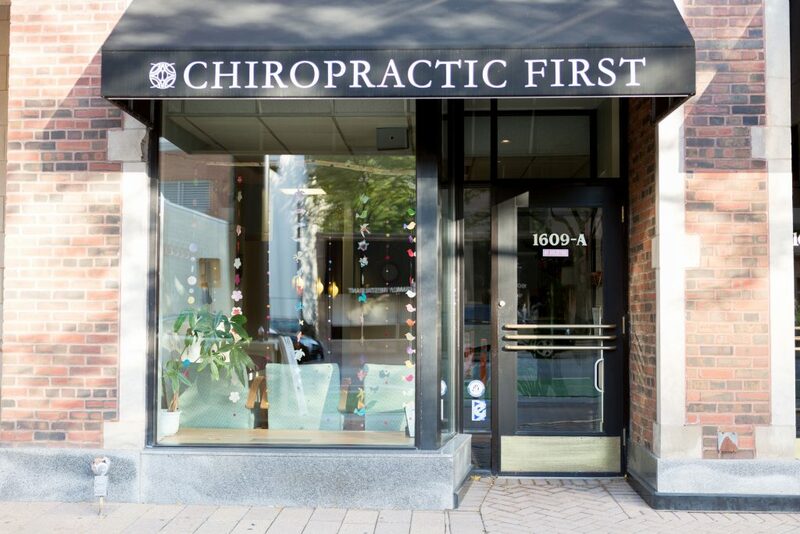 You will receive your first chiropractic treatment, called an adjustment, on your first visit. The type of chiropractic that we practice at Chiropractic First is called BioGeometric Integration. It is very light touch. The amount of pressure we will use on your body is similar to the amount of pressure you would put on your eyelid. Your first adjustment will last between 5 and 15 minutes. If you are able, I will have you lie face down, and then face up, and finish the adjustment with you seated. If any of that is uncomfortable or too difficult, we can easily modify your position. Your adjustment will not be inhibited if you are unable to lie down. The adjustment will feel a bit like a very gentle massage. 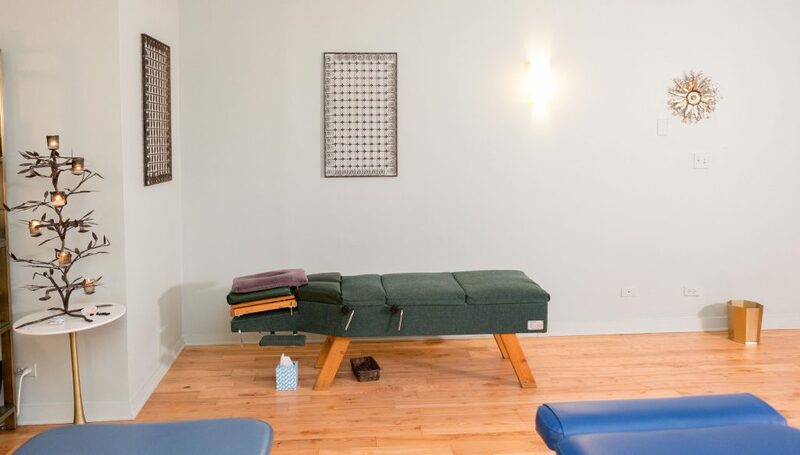 While it is chiropractic and is addressing different things, it may feel similar to a CranioSacral or Reiki treatment. There are rare cases when I do not provide a treatment on the first visit. Those cases include if I suspect a medical emergency or if I determine that I am not able to help you. In those instances, I will give you the names and contact information of someone who I think can help. 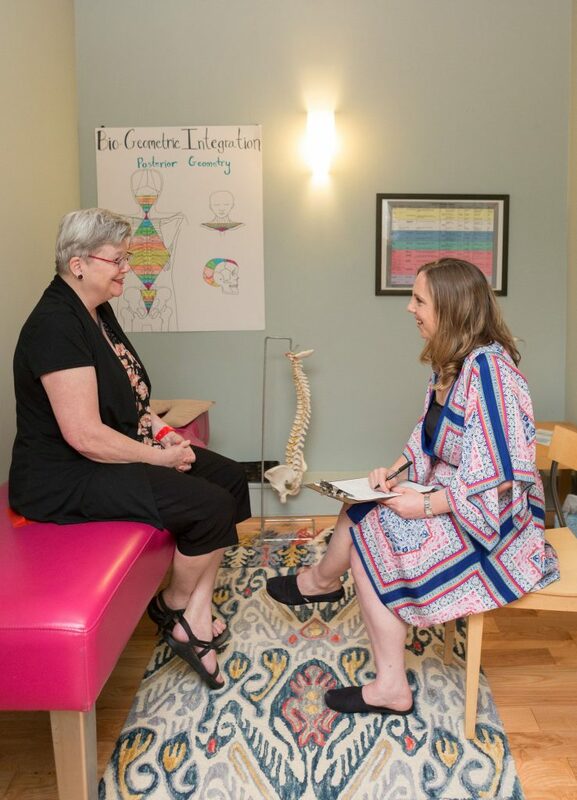 If you come in for your new patient exam on a Tuesday, Dr. Meggie Smith will do your exam and depending on our schedule, and Dr. Will Vogds may perform your first adjustment. Most patients see both Meggie and Will over the course of their care. It is great to get two different opinions and perspectives! We share all the information needed to provide you seamless care. On all other days, Dr. Meggie Smith does all new patient visits and adjusting. Chiropractic First is located in Downtown Evanston. Near the Metra and Purple line Davis stops. On your second visit we will go over all the financial details of your care. More information on that is here. Depending on your insurance benefits and payment structure, the cost will vary. At the most, the first visit is $203. But most people pay closer to $160 or less. Subsequent visits are less expensive, because they will be shorter. I look forward to speaking with you on your first visit and helping you heal! For now, please fill our the new patient paperwork (links are below) or read about some of the experiences of our patients.